Anna Restovich Braun is a native of Rochester, Minnesota. She attended St. John’s Elementary School, Lourdes High School, and ultimately graduated from Mayo High School in 1994. She earned her Bachelor of Arts Degree from the University of Notre Dame, Indiana, in 1999, majoring in both English and Theology. She graduated from the University of Minnesota Law School in 2002. Following graduation in 2002, Anna had the honor and privilege of joining her father, George F. Restovich, in his solo legal practice in Rochester, Minnesota. She is now the co-owner of Restovich Braun & Associates, along with her husband, Tom Braun. 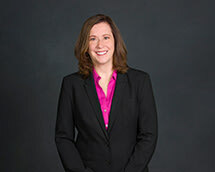 Anna has diverse litigation experience in the areas of family law (divorce, custody/third-party custody, spousal maintenance, child support), criminal defense (serious felonies including criminal sexual conduct, drug offenses, assault/domestic abuse, DUI), civil litigation (representing religious and educational institutions) and personal injury matters. She has successfully tried a number of civil and criminal cases.